In what would be a ‘better late than never’ grudge-match if it happens – and it is currently being worked on – a Brandon Rios Vs Victor Ortiz clash may finally get to go ahead, the two to finally settle their differences, on August 4. According to a piece by Dan Rafael of ESPN.com, the two faded former champions are close to agreeing the August fight date. Neither man has too much left it is thought, and as Rafael points out, no way will this fight be as big this year, 2018, as it would have been back a few years, when both men were in their prime, winning a world title and providing thrilling fights. Still, as long as the dislike between these two has lasted, maybe it’s a good thing the two veterans will at long last get the chance to get it on and rumble. 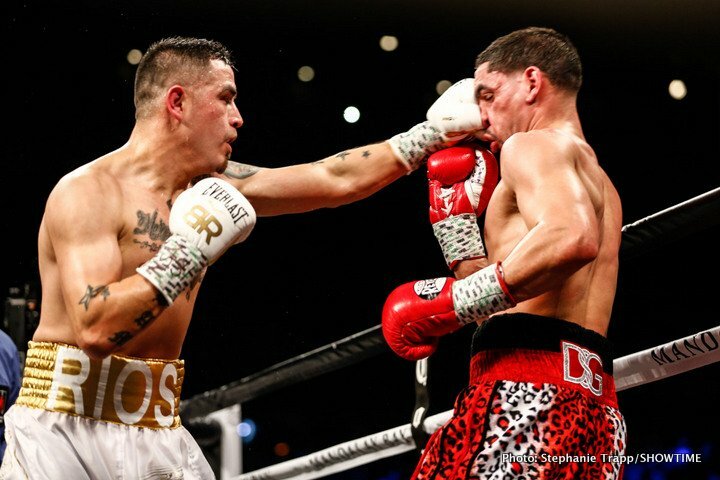 Rios was last seen being iced by former WBC welterweight champ Danny Garcia, the ninth-round KO “Bam Bam” suffered coming after he had put on a typically gutsy effort. Ortiz did a little better in his most recent fight – on paper at least – as he managed to hold another former champ Devon Alexander, to a draw (most fans had Alexander winning and winning quite wide but that’s by the by). So who has the most left and who can draw upon their bitterness and dislike for the other man to best effect: Rios, 34-4-1(25) or Ortiz, 32-6-3(25)? It seems ages ago when southpaw “Vicious” was battling it out in a genuine FOTY candidate with Marcos Maidana and then, later, losing in ‘sucker-punch’ fashion to Floyd Mayweather. Rios too has given us memorable fights, his trilogy with Mike Alvarado (also still active) being a real highlight. It’s often quite a sad spectacle seeing two shot, or close to shot, former champs slugging it out, yet in an odd way it can also be entertaining. Both Ortiz and Rios can punch, both have great heart – Rios especially – and there will be pride at stake in a big way if and when the two rivals finally collide. It’s a pick ’em fight and who knows, it might actually got the distance. But whoever wins, let’s hope he retires on something of a high afterwards. For the loser, this will be the ONLY option. You are here: Home / Boxing News / Brandon Rios Vs. Victor Ortiz: Who Wins?